With all the crazy winter snow we're having, i decided to treat the Audi to some winter tyres. 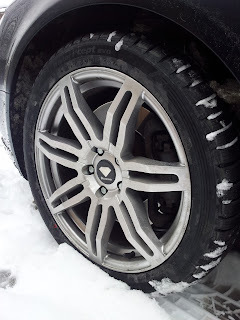 The Pirelli P-Zeros that it had on the OEM 19inch Le-Mans alloy wheels, were useless in the snow and even with the 4WD Quattro, i was still left slipping and sliding and scrabbling for grip. So here they are, a full set of 18inch "Hankook Winter I*Cept Evos" on a set of Diamond SC7 wheels. I opted for these wheels as the 7 twin spoke design looks pretty similar to the OEM Audi wheels so many wont notice i've swapped to winter wheels. 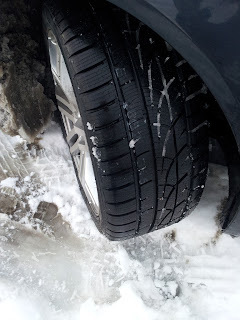 Lots have people have said I'm crazy for spending a large chunk of money on a set of winter wheels and tyres, but over in Europe, its law in many countries to have winter tyres on the car in winter and summer tyres in summer. Also, whats the point in having a 4x4 car in the snow with summer tyres? As you can see from the picture, the tread on the winter tyres is much chunkier and better designed for gripping on cold snowy roads. What you cant see from the photo is that winter tyres have a higher silica content which means the rubber in the tyres stays pliable at much lower temperatures compared to summer tyres. When summer tyres go had and lose grip, winter tyres stay soft proving more grip on cold wet roads. In fact winter tyres are best whenever the temperature drops below 7degrees, which in the UK is quite a few months of the year! !